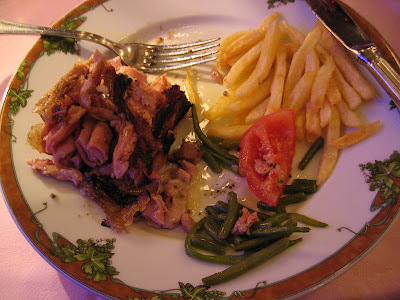 I have eaten andouillettes (not to be confused with andouille), on many an occasion while living in Paris. I had simply thought of them as tripe sausage without delving much further into more precise descriptions. I remember having savored a platter of them, with mustard, at one of my favorite Parisian cafes, Au Petit Fer A Cheval in the Marais. Those andouillette aromas of my past came wafting up when I received the following messages from A., who was in Paris, eating what he called "anduitte". Clearly spelling is an issue here but I knew what he meant. And so I offer you some amusing snippets from our exchange. A.: I doubt it is legal in the U.S. to eat what I ate for dinner. Le garçon was very pleased with my request. "Parfait monsieur, Trreeess bien". I was awarded a piece of some lardon pastry concoction as a gift. The chef came out & displayed it with much pride. How could I say no? I did have the distinct feeling of getting up close and personal with a pigs bottom. Not bad with mustard though. What do you suppose that little voice was trying to tell him? By the time the little voice spoke up, he had all but finished the dish. Would he have left that last bite had he known then what we know now? Seems doubtful. And what do we know now? "French andouillette, on the other hand, is an acquired taste and can be an interesting challenge even for adventurous eaters who don't object to the taste or aroma of feces." It has been a long time since I ate andouillettes but surely I would have remembered something of that aroma, wouldn't you think?